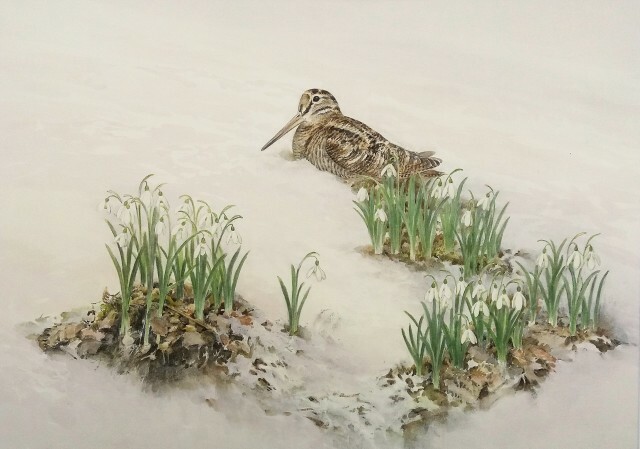 Needing little introduction as a very well known wildlife artist, Jonathan Sainsbury draws his inspiration from the simple beauty of the natural world around us. Painting in many styles and in various media he uses different techniques to express what he wishes to portray in his sensitive depictions of his subject. He also draws on poetry for his themes, using for example Laurie Lee’s Apples to inspire a painting of the same name. He may create small-scale watercolours that take us into another world, often painting trees, altering through time, changing colour with the seasons, shedding leaves, re-growing them. Sometimes Jonathan excludes the landscape around his subject to accentuate gesture. His pictures reflect the eternal struggle between life and death depicting so successfully these two aspects in his work. He has exhibited extensively with both one-man and mixed exhibitions all over the world. Jonathan has also illustrated several publications and his work is in many private and public collections. Living and working in Scotland we are delighted to show Jonathan Sainsbury's work at The Wykeham Gallery.